If you have considered traveling to some popular tourist destination then you have probably heard about Phuket Island. This amazing exotic island is located in the Andaman Sea and this is a destination for millions of tourists and adventurers every year. The reasons for its popularity are numerous – long sandy beaches, crystal clear waters, incredible flora and fauna, architectural attractions etc. This island is also known for the quality Muay Thai camps located there. Muay Thai (Thai Boxing) is martial art and a combat sport that has its roots in the 14th century. It was developed by Thai people who were looking for a way to defend themselves from the continuous attacks of their neighbors always in the mood to plunder and conquer new lands. According to the Thailand’s Ministry of Tourism the percentage of foreign visitors who go to Thailand with a sole purpose to get involved in Muay Thai training is rising every year. The people that want to practice this amazing sport are not coming from only one country – the popularity of this sport is spread on all continents. Muay Thai is also known as the art of the eight limbs which is practically a short description for this sport. Participants use their elbows, knees, fists and feet to defend themselves but also to attack and disable their opponents. Since most of the camps in Phuket have their own rings in which they organize competitions and tournaments there are many foreign Muay Thai professionals that come here to participate in fights. There are many Muay Thai camps in Phuket and some of them are offering accommodation for the visitors too. This is probably a good option for those who want to focus on the training classes. One of these camps is Suwit Muay Thai training camp. This camp has a long history and many satisfied students in their book. They own their accommodation in the camp which is quite comfortable and cost affordable. 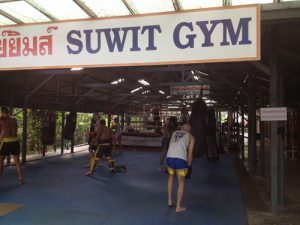 The training classes in Suwit are lead by experienced trainers and former Muay Thai fighters. This camp is located in one of the most beautiful parts on Phuket Island close to the sea and to some of the most popular Phuket attractions.